This root has a reputation for preventing evil from entering your home and clearing any negativity that is already present. Some carry it for protection from harm and to ward off illness. It is a powerful root to add to court case spells or mojos as it is believed to heavily influence the case in your favor. Carried on your person, this root will attract money to you. Sprinkle it outside your home to un-do crossings, hexes, and jinxes. Make an infusion of this root and add it to your floor wash to get rid of jinxes and tricks laid on your door step. Bathing in the tea is said to destroy an unwanted suitor's love for you, but placing some of the root under your mattress is said to attract lovers and make them stay faithful. 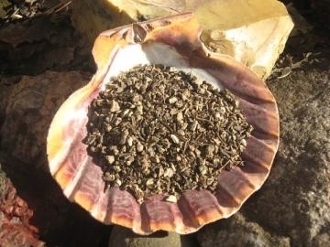 This herb also has a long history of use as both a charm and a medicine to increase fertility and ease childbirth. *DO NOT use while pregnant without guidance from professional naturopath or midwife!!! To use it as a floor sweep, sprinkle the chips onto the floor and sweep them out the door, from the back of the home to the front. To make an unwanted renter move, you may mix black snake root with their hair, burn the mixture, place the ashes in a jar, and bury it in a graveyard at the next full moon. planet-mars element-fire This root is endangered and is harvested from my own cultivated plants. You will receive one, 2x3 inch zip bag. thanks for looking! curio only.